Republican presidential candidate Donald Trump after speaking Saturday in Birmingham, Alabama. We can look deeper into the Google search data for some evidence of this. In the chart below, I’ve tracked the aggregate share of primary-related searches in the 2008 and 2012 presidential cycles, based on the number of weeks before or after the Iowa caucuses.2 As you can see, public attention to the race starts out quite slow and only gradually accelerates — until just a week or two before Iowa, when it begins to boom. Interest continues to accelerate as Iowa, New Hampshire and the Super Tuesday states vote, before slowing down again once the outcome of the race has become clear. To repeat: This burst of attention occurs quite late — usually when voters are days or weeks away from their primary or caucus. 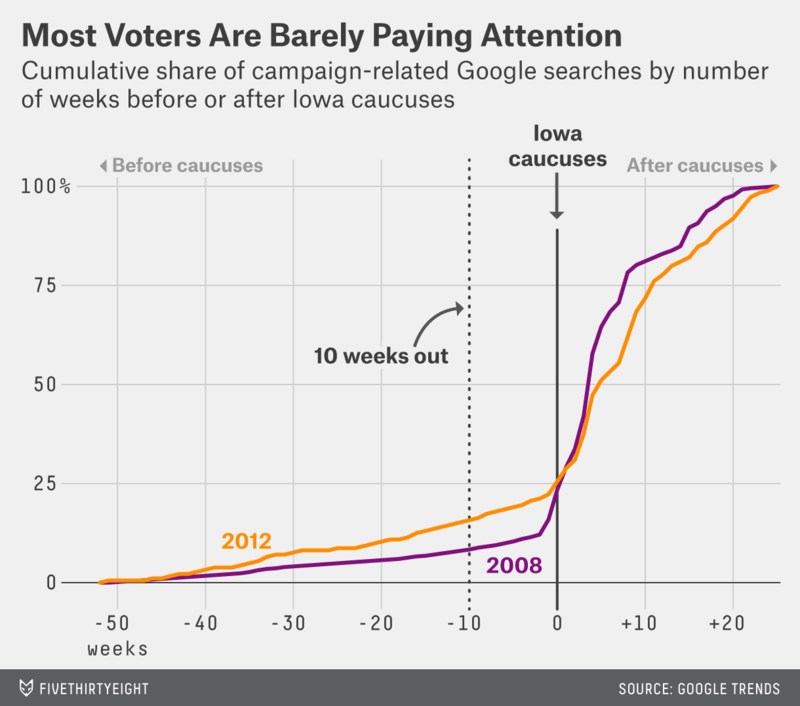 At this point in the 2012 nomination cycle, 10 weeks before the Iowa caucuses, only 16 percent of the eventual total of Google searches had been conducted. At this point in the 2008 cycle, only 8 percent had been. Voters are still in the early stages of their information-gathering process. When should you start paying attention to the polls?